Our proposed itineraries to discover the secrets of the Venetian Lagoon. (N.B. - Routes can be decided together, our proposals are only dictated by experience). Leaving the Bay of San Marco, we will go around the fascinating islands of the lagoon and then go along the island of Lido di Venezia a long narrow island that encloses the lagoon from the sea until we find the old settlement of Malamocco. A short walk will bring you to the defensive structure from the sea “ murazzi ” (walls) . Once back in the boat we cross the mouth of the port to arrive at the island San Pietro in Volta e Pellestrina, where one can admire a large fishing fleet and understand the way of life of these fishing villages. On our return we go along the canal ‘dell’Orfano’, towards the ancient islands of Poveglia, San Clemente and le Grazie returning once again to Venice. This island belongs to the Armenian Congregation Mechitarista with its monastery; On a guided tour given by the fathers, they will take you around the garden to the cloister and church. Inside the monastery one can see an important library and museum of ancient and oriental texts and artefacts. Malamocco is a picturesque fishing village near the seafront on the Lido di Venezia, an island that lies between the sea and the lagoon. Because it is surrounded by a small canal it makes it an island within an island. Its name comes from the antique Roman city of Metamauco, which disappeared around 1100 probably following an exceptional sea tide. For a period it was the site of the Venetian dogado (doge’s government). An imposing and fascinating construction for the defence of the sea. Built by the Venetian Republic of the Serenissima. Started around the 17th century, it extends for kilometres along the sea coast. 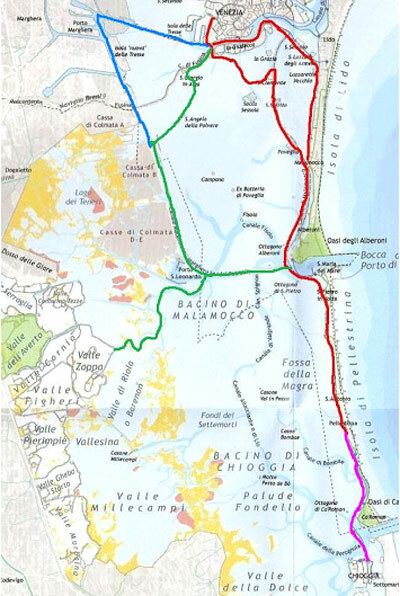 Located on the far end towards the south of the costal island Lido di Venezia, near the entrance to the port of Malamocco. It has one of the most interesting naturalistic areas of the Venetian lagoon, an oasis protected by the WWF " Dune degli Alberoni " a nature park that has resisted the advancement of the tourist beaches: It is made up of a vast area of sand dunes and marine pines where one can frequently see typical wildlife. Two small groups of houses and fishing boats where one can breath a particular atmosphere of going back in time. Everyone knows each other and the doors of the houses are nearly always open. The sea air often has with the aroma of grilled fish. - In blue: Crossing the Marchera Port between the factories and an area of particular natural interest rich in different types of wild life. - In green: Proceed along the edge of the ancient Islands of "San Georgio in Alghe" and "San Andrea della Polvere", continuing along the "Canal of Malamocco" or the ' Petroli' (where the tankers pass) and the "Canal of Piovego" between the fishing nets and baskets, sand banks and along the banks of the fishing area towards "al Cason di Valle Zappa". - In pink: Proceeding towards" Chioggia" the so called "little Venice" one of the most characteristic and important fishing ports in Italy.